Swynford is generally held to have been the youngest child of Paon de Roet, a herald, and later knight, who was "probably christened as Gilles" She had several siblings including Isabel (also called Elizabeth) de Roet, and a brother, Walter. Isabel later became Noble canoness of Saint Waltrude Collegiate Church, Mons, c. 1366. Philippa Chaucer, wife of the poet Geoffrey Chaucer, is known to have been a sister of Swynford's. It is known that Philippa was in the service of John of Gaunt's second wife Constance of Castile, before John's marriage to Swynford. 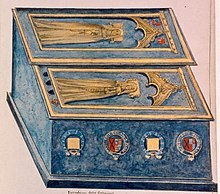 Some time after Blanche of Lancaster's death in 1368 (most likely in 1371–1372), Swynford and John of Gaunt entered into a love affair that would produce four children for the couple, born out of wedlock but legitimized upon their parents' eventual marriage; the adulterous relationship endured until 1381 when it was truncated out of political necessity and ruined Swynford's reputation. On 13 January 1396, two years after the death of the Duke's second wife, Infanta Constance of Castile, Swynford and John of Gaunt married in Lincoln Cathedral. Records of their marriage kept in the Tower and elsewhere list: 'John of Ghaunt, Duke of Lancaster, married Katharine daughter of Guyon King of Armes in the time of K. Edward the 3, and Geffrey Chaucer her sister'. On John of Gaunt's death, Swynford became known as dowager Duchess of Lancaster. She outlived him by four years, dying on 10 May 1403, in her early fifties. Margaret Swynford (born c. 1369), became a nun at the prestigious Barking Abbey in 1377 with help from her future stepfather John of Gaunt, where she lived the religious life with her cousin Elizabeth Chaucer, daughter of the famous Geoffrey Chaucer and Katherine's sister Philippa de Roet. Sir Thomas Swynford (1367–1432), born in Lincoln while his father Sir Hugh Swynford was away on a campaign with John of Gaunt in Castile fighting for Peter of Castile. Blanche Swynford, named after the Duchess of Lancaster and a godchild of John of Gaunt. (If, as suggested, she was born after 1375, this date is too late for her to have been fathered by Hugh Swynford, who died in 1371/2. However, since John of Gaunt obtained a dispensation for his marriage to Katherine for being Blanche Swynford's godfather, this theory can be discarded). Coat of arms of Katherine Swynford as Duchess of Lancaster, after her marriage to John of Gaunt : three gold Catherine wheels ("roet" means "little wheel" in Old French) on a red field. The wheel emblem shows Katherine's devotion to her patron saint, Catherine of Alexandria, also known as Saint Catherine of the Wheel. ^ S. Chrimes, Henry VII, p. 50.